Running the numbers on ICC deterrence: when does it actually work? How can intentional atrocities toward civilians be reduced in times of widespread political violence? Six years ago, we set out to discover if the International Criminal Court (ICC) has delivered results, on the ground. The research we produced (in an upcoming article for the journal International Organization), marks the first quantitative evidence that the ICC does—under the right conditions—have a deterrent impact. But our research also reveals that the ICC faces significant difficulties. Because passions relating to the Court run high, we conducted a systematic assessment of the Court’s impact. We found important evidence that the Court contributes to the deterrence of intentional civilian killing; indeed, just enough evidence to justify the international community’s support for the ICC’s work. Not enough, unfortunately, to suppose that deterrence can work if this institution labors without significant support from the rest of the world. Building on existing research on both criminology and deterrence, we developed a conditional deterrence theory of the ICC. We hypothesized that the ICC would reduce violence where it has jurisdiction, when the ratification was backed by domestic laws, and importantly, when the Court begins to investigate allegations of atrocities. Those institutional supports could enhance “prosecutorial deterrence” by increasing the chances that perpetrators would face punishment for their crimes. Before the ICC began to operate, many faced nothing but impunity. We also conjectured there would be evidence of “social deterrence”—extralegal pressure brought into focus by the norms the Court represents. We proposed that the change in social milieu would be moderated by human rights mobilization as well as aid relationships. 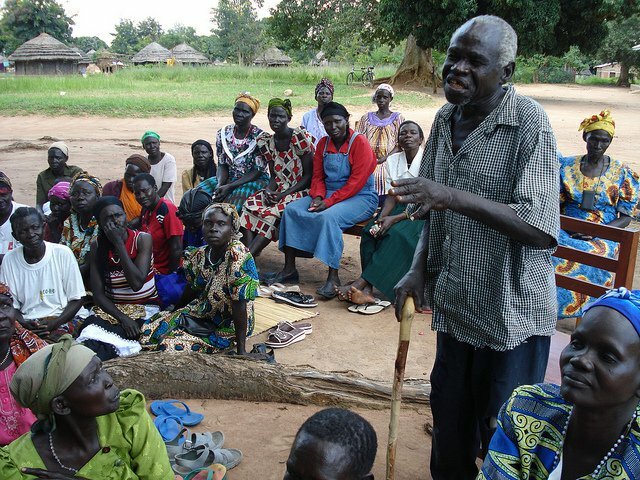 An ICC outreach meeting in Northern Uganda. To investigate these hypotheses, we collected data on the ratification patterns of the Rome Statutes by national governments, data on domestic criminal statute reforms, and data on the Court’s actions over time. We analyzed whether those ICC-related factors reduced civilian killing patterns in about 100 countries, all of which had experienced civil wars at some point in recent decades. Intentional civilian killing is one of the most salient crimes under the Court’s jurisdiction and the deterrent effect, we reasoned, was most likely to be found in countries where those crimes were most likely to occur. Our sample included all the cases in the ICC docket: Uganda, the Democratic Republic of Congo, Central African Republic, Sudan, Ivory Coast, Libya, Kenya, and Mali. Additionally, it included cases such as Colombia, as well as potential cases like Israel. We looked at civilian killing patterns from 13 years before the Court entered into force (2002) and nine years after—using the One-Sided Violence dataset between 1989 and 2011. We analyzed the behavior of national governments, their armies and allies, as well as that of about 250 rebel groups. No study to date has tried to assess the ICC’s impact on such a broad range of actors. The Court’s jurisdiction appears to work synergistically with growing human rights organizations locally.We were intrigued by what we found. The ICC had some deterrent effects on national governments and their forces—and, as we predicted, these were indeed conditional on several things: ratification status (important for jurisdiction), domestic legal reforms, and the Court’s clear intent to prosecute by initiating investigations. And, again in line with our speculations, the Court’s jurisdiction appears to work synergistically with growing human rights organizations locally: intentional killings drop most in places under the Court’s jurisdiction and where human rights groups are on the rise. Local social context matters. We initially thought that the Court’s jurisdiction might deter rebel groups, but found only limited evidence of this. Only under very narrow circumstances—for secessionist rebels with centralized command, who represent those who want to rule and are therefore more sensitive to social deterrence—did we find some evidence that the ICC’s jurisdiction matters. Surprisingly, however, we found that rebel groups seem to be strongly deterred when investigations begin. Our evidence suggests that rebels are not impressed with international law and organizations that exist only on paper. But when the ICC signals a determination to prosecute, it’s another matter. The result of our work indeed provides evidence that the Court’s deterrence effect, both prosecutorial and social, exists. There is now some reason to think the ICC saves some lives—but the ICC is also deeply embedded in the world of politics and faces challenges in securing state support and capturing criminals. For instance, it is difficult to implement meaningful judicial reforms in countries with weak legal systems. Additionally, our quantitative results should not be taken out of context. We have carefully specified the conditions under which the Court is able to deter; we have not claimed a blanket deterrence effect everywhere. The issue should not really be exactly how many lives the ICC saves or the precise percentage reduction in violence—these will vary based on model specifications, data coverage, and measurement issues—but whether we find some deterrent effect or not, and under what conditions. Our work on a global sample has drawn us to look closely into country cases. We are starting to look more closely into the Court’s first case, Uganda. With Mitch Radtke (Texas A&M University), we just finished a preliminary investigation into the ICC’s work in Uganda—a country plagued by years of political violence and that has been under the Court’s jurisdiction since 2002. Using very specific data from the Armed Conflict Location and Event Data (ACLED), we tracked down the monthly actions by the Government of Uganda (GoU) as well as the Lord’s Resistance Army (LRA) in relation to four “interventions”—Uganda’s signature and ratification, as well as the ICC’s investigation into atrocities, and its issue of rebel arrest warrants in that case. We found that the ICC to some extent precipitated legal reforms that reduced violence by the GoU. On the rebel side, the LRA’s violence spiked after Uganda joined the Court, but the violence was reduced after ICC investigations began in February 2004. This was not due to people fleeing some villages, or the LRA roaming the territory of Central African Republic, or the absence of battle actions. Our analysis showed that the reduction in violence could be traced to the ICC’s announcement of its investigation. Political violence cannot be stopped by one institution. But it is important to assess the impact of the one Court that was developed specifically to support peace and justice worldwide. Criminologists have been studying domestic deterrence for decades. It is time to take international crimes equally seriously. Our contribution is to systematically study this pressing question, and we encourage others to conduct replicable studies in this area as well.